One of the first things we do when we come across something great is to tell a friend or family member about it immediately. A great restaurant, a good movie, an engaging book, useful merchandise, etc. the list goes on. Funny as it sounds, We had the same urge when we came across the Work Sharp Knife and Tool Sharpener. That’s because this power tool came loaded with awesome features! One of the best knife & tool sharpeners. Click to check features and review. It’s also partly the reason why we’re writing this article. This unit brought excitement to a lot of folks looking for a powerful handheld sharpener. So, as we try to curb our enthusiasm, let’s go through what makes this handy tool so useful! The WSKTS, as it’s also known, is a light power tool that is designed to sharpen your knives and tools with finesse and precision. We were especially impressed with its built, ease-of-use, and versatiliity. 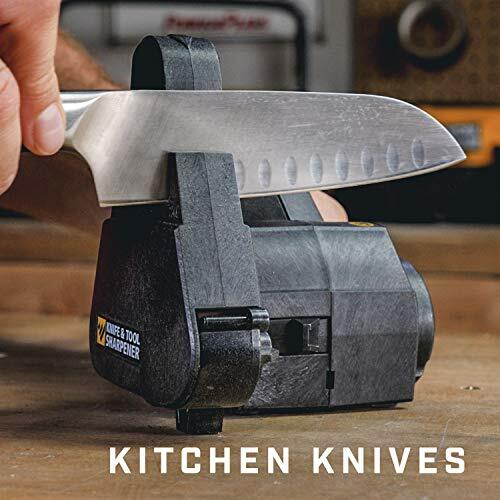 This powerful knife sharpener is the little brother of the Ken Onion Edition and will whet and polish the edge of practically any knife. It includes kitchen, filet, outdoor, hunting, pocket and tactical knives, etc. It doesn’t matter if your knife is straight, curved, tanto, serrated, gut hook, etc. The WSKTS will sharpen any edge of your blade. Received more than 3000 reviews. One of the best mid-range price multi-purpose sharpeners. The power tool measures 9 inches in length and 5 inches across. At just over 2 pounds, it’s comfortable to hold and carry. There are no unnecessary peripheries or attachments. The product comes with a set of six abrasive belts. A coarse, medium and fine belt (2 pieces each). You can easily remove and attach these belts depending on the size and built of the knife you want to sharpen. It comes with two sturdy sharpening guides, one for kitchen knives and the other for outdoor knives. They let you place your blade in the correct angle (while sharpening) so that the bevel of the knife is not damaged or changed. 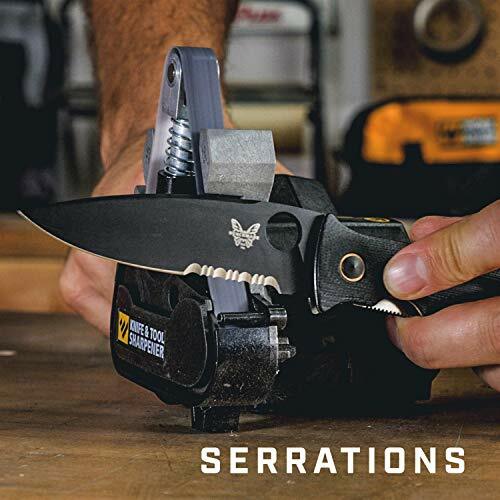 The adjustable sharpening cassette provides ways to sharpen different knives and tools. It works as a sharpener as well as a grinder. You can use the WSKTS on a variety of larger blades. It works on shovels, axes, hatchets, hoes and even lawn mower blades (yes, you heard that right). If that isn’t enough, you’ll be glad to know it sharpens scissors and pruners too! At first, I wasn’t sure whether to add this as a ‘feature’ for the tool. But I learned that Darex (the maker) is a 4th generation manufacturing company, known for quality tools (45-year track record). Every bit of Work Sharp electric belt sharpener is designed and assembled in the US. In short, like a charm. 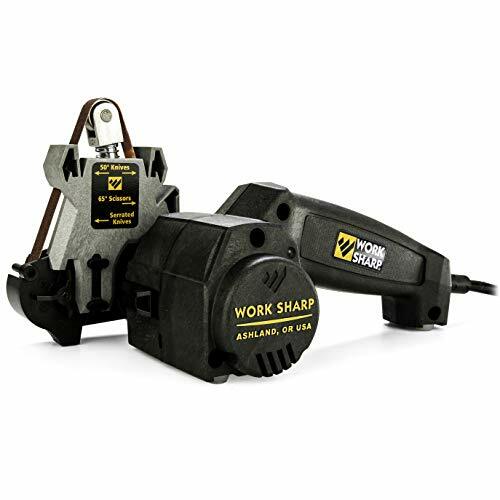 The Work Sharp Knife & Tool Sharpener is a versatile and powerful sharpening machine. Simple and easy to operate. No assembly out of the box. All you have to do is plug in the power cord (110v) and fix the angle guides depending on the type of knife you want to sharpen, and you’re good to go. Just like many of the high-quality electric sharpeners, it’s all set with a clear mission in mind. To get laser-sharp edge in minutes. The three-position power switch is located underneath the hand grip. Press once on one side of the switch to turn it on continuously and the other side for short burst of sharpening as long as your hold on to the switch (momentary on). The center is the off position. There are 2 ways to use this sharpener. You could let it rest on the table to sharpen any knife or by freehand to sharpen other type of tools. To sharpen the European style of kitchen and filet knives, use the 40° guide (20° on either side). And install the 50° guide (25° each side) for outdoor or hunting knives. The 50° guide also includes serrated and scissor guides. The choice of the flexible abrasive belt should depend on the quality and condition of the knife. The green (80 grit) belt is ideal for stronger and dull blades. The red medium belt (220 grit) is usually suitable for most kitchen knives. And the purple belt (6000 grit) is used to polish and provide quality finish on the knives. First, select the belt and install the appropriate angle guide. Place your knife on the right side of the guide, press the switch, and with a steady motion, pull the blade across the guide from the bolster to the tip. How many times you repeat the action depends on the material and condition of the knife (average is five strokes for regular kitchen knives). Repeat the process on the left side of the guide, so that your knife gets even bevels on both sides. Once a burr is developed, either swap in the medium belt (P220) or the fine belt (6000 grit). If you started off with the medium belt for kitchen knives, then use the fine belt to hone and polish the blade. Repeat the steps again. Replacing the belt is a snap by pressing the spring tension which takes less than one minute. By now your knife should be razor sharp and ready to use. 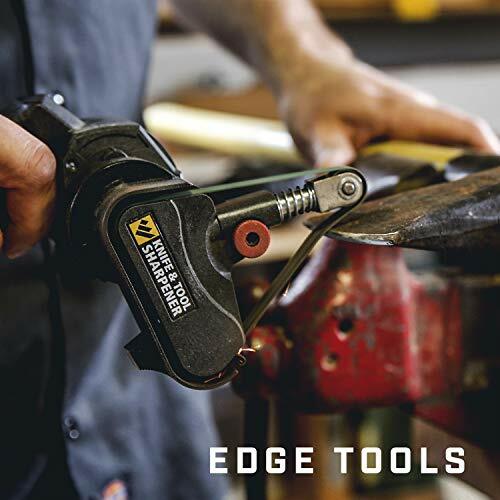 By examining the edge using a powerful magnifying glass, you’ll notice the convex-shaped along the entire edge driven by the belt grinding technology. The convex grind is proven to outlast the V-shaped edge sharpened by other types of sharpeners. Work Sharp seems to have taken full advantage of this slack belt sharpening technology. Sharpen serrated knife only on the flat side of the blade. To sharpen serrated knife, install the purple (fine) belt and the outdoor guide. Place the flat side of the serrated blade across the belt and sharpen it. For scissors, make use of the scissors guide and sharpen only the bevel side, not the flat side. The medium belt is usually used for scissors. Sharpen any types of blades inlcuding lawn mower blades, garden pruners, shears, shovels, scrapers and more. For sharpening bigger tools, use the green belt and remove the guides. Place the blade (axe, mower blade) in a clamp (bench vises work great here!). Pick up the tool, rotate the sharpening cassette (using the release button) to the appropriate angle and let the abrasive belt rest on the edge of the blade. Grind and sharpen it according to the angle you desire. The versatility of Work Sharp Tool & Knife Sharpener can sharpen any tool with a blade, such as the axes, mower blades, hatchets, garden shears, shovels, swords and many more. Sturdily built by Darex, an American company. Darex designs and engineers the product themselves. Versatile and sharpen a variety of tools. It works on hatchets, mower blades, hoes, scissors, shears, etc. The abrasive belts are durable and come in options (coarse, medium, fine). The coarse and medium belts have water-proof polyester backing. The fine belt has a polyester emulsion. It may not be the best choice for a lawnmower blade. That is not to say it doesn’t work. But there should be other more efficient options. The abrasive belts measure ½ inches across. It’s a minor issue, but if the breadth was slightly wider, say an inch, it would work even better on bigger blades. Not for Japanese style of knives with the thinner edge. However, the Work Sharp Ken Onion Edition could work this out as it comes with adjustable angle guides for all types of knives. When sharpening, power down the machine as the tip approaches the end of the guide. It should prevent the tip from getting rounded. You can apply masking tape on the face of the knives to avoid scratching the surface when sharpening. Avoid putting too much pressure on the blade as you grind it (don’t add weight or lean on it). Let it merely rest on the guide as you pull it out with a steady action. Whenever in doubt, consult the user manual. It’s a treasure trove of instructions, insights, and explanations. If you ever lose your copy, you can download a PDF version from the Work Sharp site. You could bring it along for camping or any outdoor trip if you think you need to use the sharpener. But also remember to bring along the 12V inverter. Who is the WSKTS tool sharpener for? This sharpening machine is for absolutely anyone who needs to sharpen household and outdoor knives/blades and any tools razor-sharp. It is the first knife and tool sharpener with adjustable sharpening cassette. Follow the safety and instructions on the user manual, and you should be good to go. However, If you prefer a simple belt sharpener with a fixed angle of 25-degree, then go for the combo knife sharpener. The WSKTS comes with the standard one-year warranty. It’s a versatile, heavy-duty, and high-efficiency sharpener everyone adores. Important: The manufacturers make it clear that this tool is NOT for industrial uses. If you do use it for purposes beyond its design (and I sure hope you don’t), you do so at your own risk. The WSKTS is one of the few power tools out there that delivers on its promises. What you see on Amazon, is what you get in effect. Gone are the days when we had to scramble for different tools for different blades. The old whetstone in our kitchen is now a glorified paperweight. 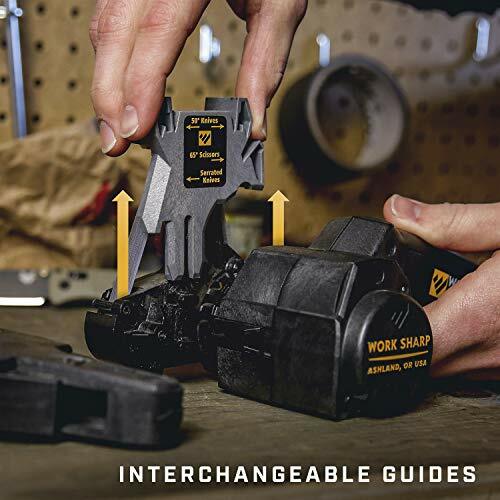 The Work Sharp Knife & Tool Sharpener is your universal knife sharpener and it comes at a cost that puts some of the other fancy sharpeners to shame. It’s a professional tool that does so much for so little, everyone could afford it (one-time investment).